For over 30 years, the people of France have been wracked by war with Spain. During that time Lutheran heresy spread from Germany into Catholic Europe and the Spanish Empire. In 1558 Emperor Charles V, a Fleming by birth, abdicated the various parts of his empire to his heirs and, at the age of 58, increased the powers of the Inquisition to deal with the suspected heretics and retired to the monastery of Saint Just. The French were defeated by the Spaniards and in 1559 a peace was decreed. The terms of the treaty were to include the betrothal of Elisabeth de Valois, daughter of Henry II, King of France, to Don Carlos, Prince of Asturias and Infante of Spain. But before the marriage was celebrated, King Philip’s English Queen, Mary Tudor, the daughter of Henry VIII, died. As Elisabeth I of England showed no interest in succeeding her sister as Philip’s consort, the name of the father was substituted for that of the son on the peace treaty and Elisabeth de Valois was to marry King Philip II instead of his son. Elisabeth de Valois is on her way to Spain and reassures the suffering people of France that peace is at hand. She is greeted by Carlo and immediately the two feel attraction for one another. 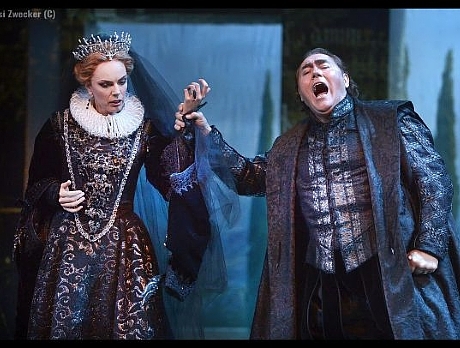 When the news arrive that Elisabeth has to marry the father of the man she is attracted to, she agrees for the good of her country and the peace of her people, while Carlo is left distraught. Don Carlo, the son of King Philip II, arrives at the monastery of Saint Just, to the tomb of the Emperor Charles V whose shadow is ever present there. He wants to see Elisabeth de Valois, his father’s wife, who will come there with the King to pay homage to Charles V. Carlo confesses his love for Elisabeth to his dearest friend Rodrigo, Marquis of Posa, who has just returned from the Netherlands. Rodrigo paints a grim picture of the oppression it suffers and urges Carlo to go to Flanders. Princess Eboli entertains a group of the Queen’s ladies-in-waiting. The Queen joins them. Rodrigo asks Elisabeth to intercede for Carlo with the King as he wants to leave for Flanders. 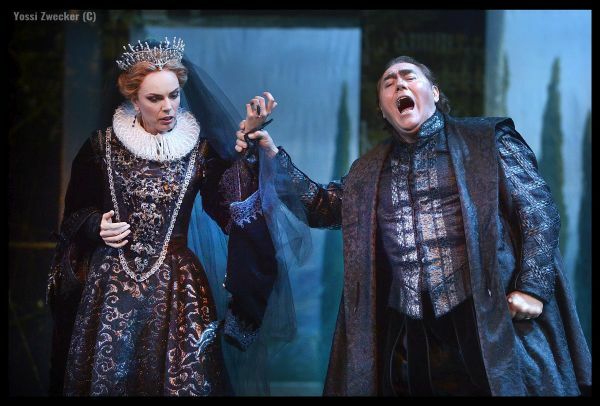 Carlo appears and Elisabeth struggles to remain calm. Her sense of duty as Queen triumphs over her love. Philip is angry to find the Queen unattended and orders the guilty lady-in-waiting, Countess D’Aremberg, back to France. Rodrigo is detained by the King and seizes the opportunity to protest about the plight of Flanders and urges him to give its people freedom. 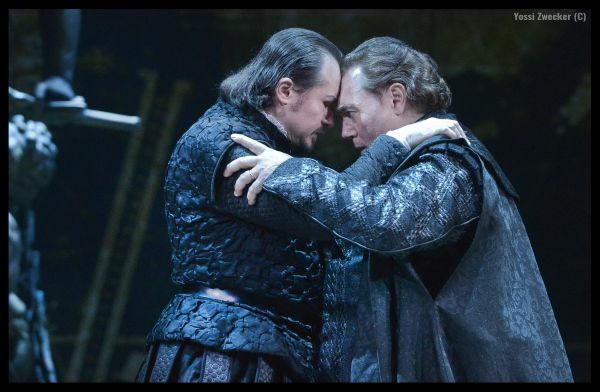 Impressed by Rodrigo’s integrity, Philip confides his worries about Carlo and Elisabeth’s love and warns Rodrigo to beware the Grand Inquisitor. Festivities have been arranged but Elisabeth wishes to spend the night in prayer, and entrusting Eboli with her mantilla, necklace and mask, asks her to stand in for her. Carlo is awaiting Elisabeth but Eboli, who is in love with him as well, appears instead. Mistaking Eboli for Elisabeth, Carlos declares his love. Suddenly it dawns on her that Carlo and Elisabeth are lovers and she threatens to reveal it to the King. At the same moment Rodrigo appears but even his determined arguments cannot calm her down. Rodrigo persuades Carlo to give him the secret documents with regard to the freeing of Flanders from the Spanish yoke. A throng of people, gathered for an auto-da-fe, sings the King’s praises. A group of heretics has been sentenced to death by the Inquisition. 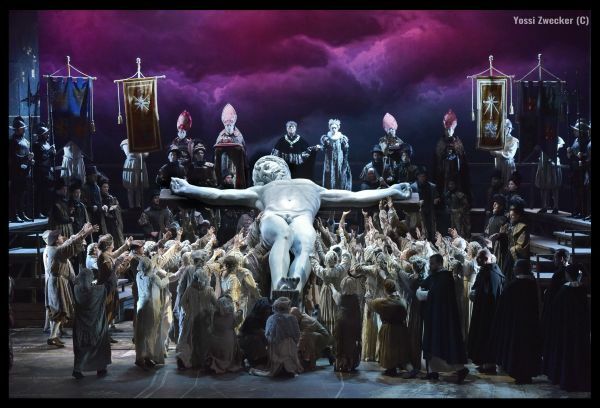 While they are waiting to be burnt at the stake, Carlo enters at the head of a group of deputies from Flanders and asks the King to show clemency and restore the peace to their country. Philip bluntly refuses. Carlo now demands that his father entrust to him the regency of Flanders. When Philip dismisses the request, Carlo draws his sword and vows to be the saviour of that unhappy land. 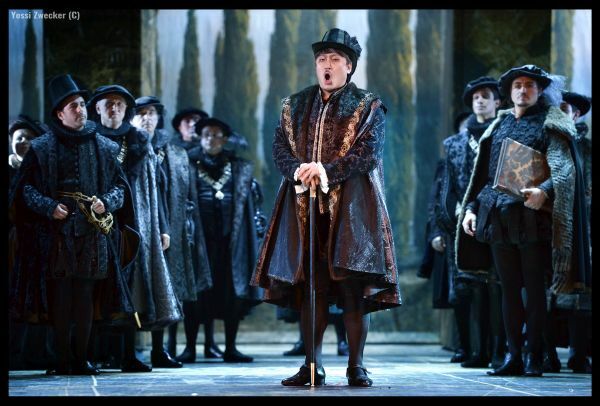 The King is enraged and orders that Carlo be disarmed. No one makes a move to do so, aside of Rodrigo, who disarms Carlo, and is elevated to a dukedom by Philip. As the auto-da-fe continues a celestial voice is heard comforting the dying. Philip muses wretchedly over his failure to win Elisabeth’s love. 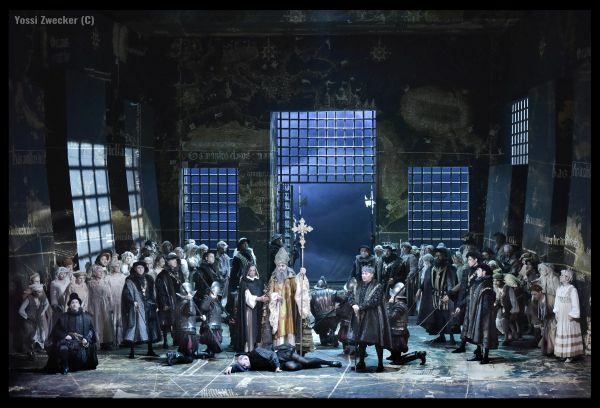 The Grand Inquisitor enters and assures Philip that, if it is for the good of the faith, there can be no objection to having Carlo murdered. But Rodrigo represents a greater danger and if Philip persists in protecting a heretic, he will have to answer for it to the Holy Office. Elisabeth is indignant to find her jewel box stolen. Eboli has secretly stolen it. Philip has it on his table, and when Elisabeth refuses to open it, he forces it himself. A portrait of Carlo is found inside. When Philip denounces his wife as an adulteress, she faints. Eboli and Rodrigo enter. Rodrigo realizes that immediate action must be taken to save Carlo. 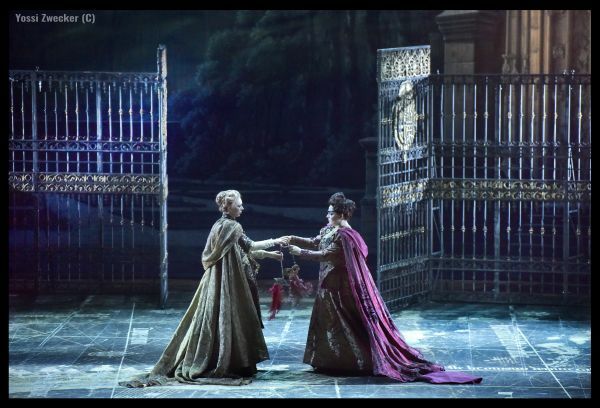 Eboli repents her deed, and left alone with the Queen, she confesses her guilt and her intimate relationship with the King. Elisabeth banishes her from the court: she must choose between exile or the cloister. 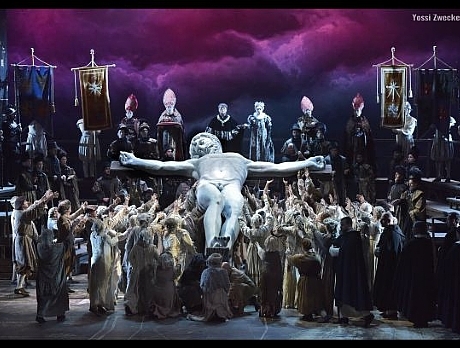 Eboli resolves to save Carlo. 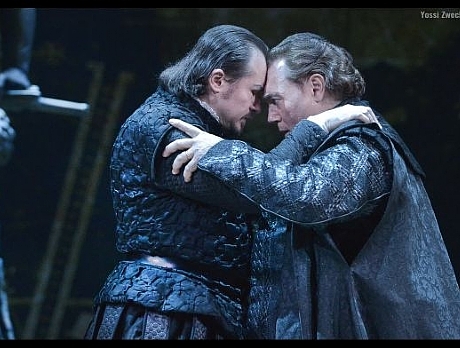 Rodrigo comes to bid Carlo farewell at prison and encourage him to free the people of Flanders. 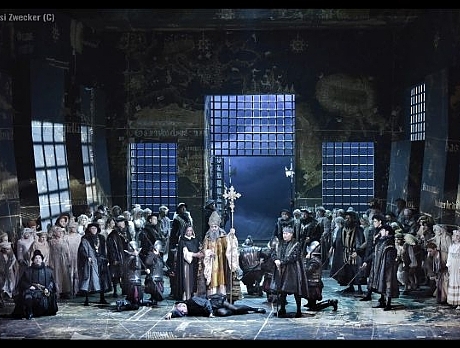 He confesses to Carlo that he has played the secret documents concerning the rebellion in Flanders into the hands of the King, and that a death sentence will fall upon him. Two men appear at the cell door and Rodrigo is shot. As he dies, he tells Carlo that Elisabeth will be at Saint Just the next day. 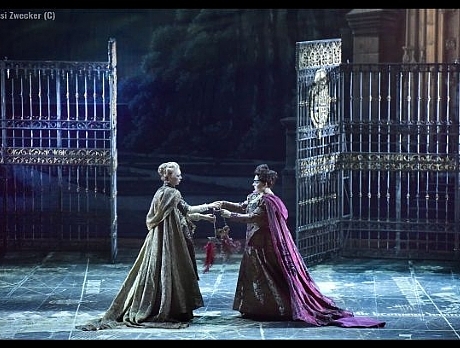 Philip enters and gives Carlo back his sword, but Carlo turns away from his father, the murderer of his best friend. The people attempt to storm the prison in order to set Carlo free. For a moment Philip seems in danger, but the appearance of the Grand Inquisitor reduces the mob to submission. Meanwhile Eboli enables Carlo to make his escape. At the tomb of Charles V, Elisabeth recognizes that her earthly task will soon be done. Carlo comes to bid her farewell. Elisabeth blesses his Flanders mission, and they look forward to meeting again in a better world. They are surprised by the arrival of Philip and the Grand Inquisitor. 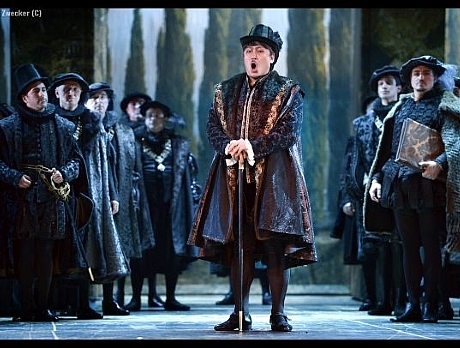 The King orders Carlo’s arrest.